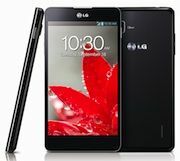 LG strengthens its smartphone offering with Optimus G | What Hi-Fi? Slightly overlooked amidst all the hype between Apple's iPhone 5 launch and its first sales today, and the interest surrounding HTC's Windows 8 phones, LG has announced its Optimus G, a 4.7in-screen smartphone it hopes will help claw back some of the market-share it currently cedes to Samsung and Apple. The new phone, announced and on sale Korea this week. due in Japan next month and the US and other markets in November, is predicted to sell 2m units in the last quarter of the year. That's only a fraction of the 10m Galaxy S3 handsets Samsung has sold in the two months since its launch, and about the same number as iPhone 5s Apple claims to have pre-sold in the 24 hours following its announcement a couple of weeks back, but if achieved it would still at least double, and possibly triple, LG's recent smartphone sales. The slimline Optimus G, just 8.45mm thick, has been made possible by integrating display and touchscreen technology – in the form of ZeroGap Touch from LG innotek and LG Display's True HD 1280x768-pixel IPSPlus panel – in a single module, Meanwhile the new battery, from LG Chem, has an extended 800-cycle life. The phone runs Android 4.0 Ice Cream Sandwich on Qualcomm's Snapdragon S4 Pro processor with 1.5GHz Quad-Core Krait CPUs, has 2GB of RAM and 32GB of storage, and operates on 2G, 3G and LTE. It's fitted with a 13MP front camera, and a 1.3MP rear one, and has built-in GPS, MHL video connectivity and NFC contactless payment technology. It has a black unibody design, with the back treated with LG's own Crystal Reflection finish, using a polarised layer under the surface to give a sparkling effect. The Optimus G allows the display and use of two screens simultaneously for multitasking, dual-screen mirroring with another display, quick memo to allow fingertip writing of notes or numbers, and can even wake you up in the morning with an alarm and your favourite app up and running, so you can read your emails as soon as your eyes open! Oh, and the camera has a 'Cheese Shutter', allowing a picture to be taken by voice activation: you just have to say 'cheese', 'smile' 'kimchi' or even 'LG'! Speaking at the launch, Dr Jong-seok Park, head of the company's Mobile Communications Company, described the Optimus G as 'a groundbreaking premium device not only in the history of LG but also in the smartphone industry.